Achacha is up over the hill from where the Sea Life centre is now, over looking Loch Creran. In the past this was an area of land much used in trading by the Campbells of Barcaldine. It has clearly been an area of significant importance to Man from the very early days as there are a number of ancient monuments in the area. They are said to mark the site of a conflict between the clans McDougall & Grant, and the stone is said to mark the site of "The Grants" grave who was slain in the battle. (NM 9444 4075) Standing Stone (NR). 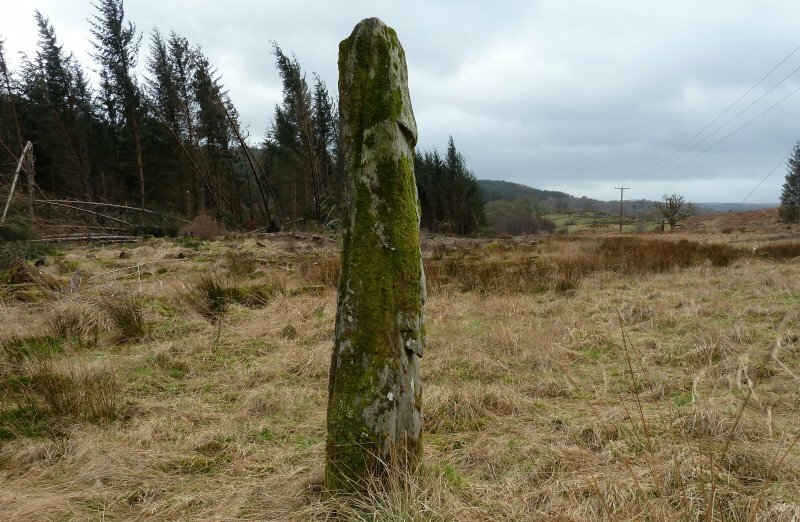 About 80 metres east of the cairn NM94SW 8, is a standing stone. Aligned approximately E-W, it measures 0.65 by 0.33 metres at base and is 2.5 metres high. The stone rises with a taper to a slightly rounded top. Visited by OS (WDJ) 28 April 1970.
in the same area is a well dedicated to St Columba. Further documents and records illustrate the "decline" into being the home of tenant farmers thence to crofters and blacksmiths. It is identified on a number of maps but not until the 1800s when it was already tenanted out. The property did seem to be have been traded quite a bit .. and it would be really interesting to learn how much property exactly the 3 / 4 / 6 merklands value cover on the ground. Bond of manrent by Duncan McDonill VcDonchie VcEntire in Glenno, Malcolm McEanduy VcGillichreist VcEntire in Inverliver in Glenetive, John McOlchallum VcEane VcDoinel in Glenketelin and Donald McEanduy VcDonill in Achnaba, Gillipatrik McGillespik VcEane VcDonchie in Achnacreive, John Du McNicoll VcGillipatrik in Stron Milachane, Molcallum McOlchallum Roy in Achnaba, Gillepatrik McDonchie Duy in Barbrek Lochow, John Du McGillechallum VcEane VcDonchie in Achacha, Molchallum McGillipatrik VcEanduy in Achannba, John McGillipatrik VcEane, John McEane VcGillichallum in Lagnaha, John McNicoll VcEane Glais in Ardeachaine, Torquil McEane VcDonche, John Du McDonche VcEan VcDonchie, Donald McGillipatrik, John McEntyre in Crag in Bradalbin, and Donald McGillipatrik in Bar, for themselves and for all descended and to be descended of their loins and loins of their successors, and those descended of loins of Gillipatrik McDonill VcEntyre who took division in Lorne from the laird of Glenurchay, and for all those of their race that shall hereafter subscribe this bond, all those of surname of McEntire renew bond and tie of service and manrent due to the lairds of Glenurchay, to John Campbell, younger, of Glenurchay, conform to tenor of first bond. Title Rental of John Campbell of Auchaw. Description The lands of Achachaw (Achacha) and Barnamuck (Barnamuc) in the parish of Ballevodan. 16. Extract interdiction by Archibald Campbell, eldest son and apparent heir of John Campbell of Achacha, to John, earl of Breadalbane, and others, 16 March 1694. Reg. B of C and S, 28 March 1694. Description Accused of Theft of three mares. Guilty. In respect of the depositions of witnesses To pay 8 pounds each for the mares and 100 merks expenses. 1. Bond for £438:5:4d. scots dated 8 June 1694 by John Campbell of Acha and Archibald Campbell, his son. 2. Bond for 144 merks scots of 22 July 1696. 3. Bond by Archibald Campbell of Achacha of 10 May 1699 for £132 scots. Provides that said bonds may be security only on lands of Acha and Carnamuck disponed on 11 May 1699 at Castle Kelchorne by said Archibald Campbell to said Earl 15 May 1699 This record is Open. GD112/2/1/13 Obligation by Archibald Campbell of Inveraw, Castlekelchurn, that, whereas John, earl of Breadalbane, has delivered up to him bond for 800 merks to Archibald Campbell, sometime of Acha, as remainder of price of his lands, he shall have no further responsibility for his maintenance as in bond dated at Castlekelchurne on 13 May 1699 15 May 1699 This record is Open. Description With consent of his interdictors (Archibald Campbell of Inneraw, Duncan Campbell, his brother, Dougall Campbell of Stronacharmick and Alexander Campbell of Clonmachrie) and his maternal uncle, Colin Campbell, sheriff clerk of Argyll, to John, earl of Breadalbane, of 6 merklands of Auchacha and 4 merklands of Barnamuck, parish of Ballevadan, lordship of Lorne, Argyll, saving to James Stewart of Fassnacleigh his wadset of Barnamuck, to Anna Campbell, his mother, widow of John Campbell of Auchacha, her liferent of half Auchacha and a quarter of Barnamuck, and to Janet Campbell, widow of Lauchlan Campbell of Auchacha, elder brother to said John Campbell, and now wife to Archibald McKorquodale of Phantilands, her liferent of the other half of Auchacha and quarter of Barnamuck. Writer, Alexander Campbell, notary public. Alexander Campbell of Barkaldine, Donald Campbell, baillie of Muckairne, Archibald Campbell of Skinderlands and Alexander Campbell of Glenmakrie. Title Letter from Colin Campbell [who signs himself "Your affectionate Brother"] and Marjorie Campbell to Alexander Campbell of Barcaldine, elder. Empowering Barcaldine to bargain with "Ladie Susan" who (they think) will buy the said Marjorie's jointure outright rather than pay the required sum yearly. The suggested price is 4,000 merks minimum. Title Assignation by Anna Campbell, Inveraray, widow of John Campbell of Achacha, narrating that by marriage-contract 31 December 1657 she had liferent right to half of 6 merklands of Achacha and quarter of 4 merklands of Barnamuck, parish of Balleivodan, lordship of Lorne, Argyll-shire, and that John, earl of Breadalbane has purchased said right for 1200 merks scots, and therefore assigning rents etc. Description Written by Archibald Campbell, servant to Colin Campbell, Sheriff-clerk of Argyll. Subscribed by Colin Campbell and Archibald Turnor, notaries. Witnesses, John Campbell, brother to Alexander Campbell of Glenmacrie, John Colquhoun and Alexander Kennedie, servants to Duke of Argyll, and John McKellear, son to John McKellear in Maam. They therefore wadset to Alexander Campbell of Barcaldine for 5000 merks the 4 merklands of Auchnacroish and 4 merklands of Barnamuck in parishes of Kilmaluag and Ballevaodan, lordship of Lorne, Argyle-shire, with superplus duty of £60 scots payable out of wadset lands of Achacha and Achinryer, parish of Ballivaodan, and of 40 merks scots payable out of wadset lands of Barnamuck, repayable at Whitsunday 1712. If Patrick Campbell redeems wadset of Barnamuck from James Stewart etc this to be redeemable from him for 2000 merks at Whitsunday 1714. Description Narrates wadset 1 June 1674 by said Earl, then John Campbell, younger of Glenorchy, to Donald Campbell, for 3700 merks scots of 4 merklands of Innerynan Easter and 4 merklands of Nether Fernoch. Also bond of eik 8 January 1678 by said Earl, then John, Earl of Caithness, for further 3800 merks scots. Now by way of excambion grants to said Patrick Campbell wadset right for 7500 merks to 6 merklands of Achacha and 6 merkland of Achinryre, parish of Balleveodan, lordship of Benderloch, Argyle-shire, saving tack to Alexander Campbell of Barcaldine of 6 merklands of Achinryre, redemption not to take place within 15 years. Written by Patrick Campbell, one of the parties. Witnessed by Duncan Toshach of Monievaird and Alexander Chrystie, chamberlain to Earl of Breadalbane. 1720, September 5. Requesting dispatch to him of four pairs women's white gloves - "the best you have" - and some green and black silk. Description Written by Duncan Campbell, notary in Lorn. Witnessed by Patrick Campbell, younger of Barcaldine, James Campbell, his brother, Duncan Toshich, wright in Achacha, and John McLauchlane, tenant in Coulcharron. Executed notarially by writer and Alexander Steuart, notary public. Description Note: tacks are set by Patrick Campbell of Barcaldine unless otherwise stated. Tack to Mary Campbell, Barcaldine's mother, of half 6 merkland of Acha, for 3 years. Description 1734, February 16, March 12. Whereby said Patrick dispones to said earl in liferent and said John, lord Glenorchie, in fee, half lands of Ardeonane alias Ardeonag (specified) in lordship of Edenkillie, by annexation in lordship of Desheor and Toyer, sheriffdom of Perth, in excambion for lands of Achacha and Auchinryre, in parish of Ballwoaden, lordship of Lorn, sheriffdom of Argyll, wadset by deceased John, lord Breadalbane, to Patrick Campbell, son of Donald Campbell of Inverinan. Reg. B.C.S. 19 November 1734. Description Dated at Clachansale, Inveraray. 1733, September 8. Narrating his efforts to collect money on recipient's behalf. "… I am glad to understand you've gott the reversion of Acha and Achinrayre as alsoe the Earl's fearm lands in Lessmore …"
Title Protested bill accepted by James White, joiner in Achaha, and protested by John Corsar wright in Inveraray. (3) Tack 1771, March -, to Patrick Doune in Acha of 6 merkland of Acha in parish of Ardchattan, for 15 years. Title Letter from Duncan McIntyre to Alexander Campbell of Barcaldine, advocate. Description Has found tenants for Acha, Glenure and Elerig, if the rent asked is not more than £60. Dated at Achinraire. Title Letter from William Campbell to Alexander Campbell of Barcaldine, advocate. Description 1787, April 26. Barcaldine. Agrees to take a quarter of lands of Acha at a higher rent than the other tenants if Barcaldine gives £50 or steelbow cattle to the same value. Dated at Brackly etc. Title Letter from Donald Turner, S.S.P.C.K. schoolmaster at Muckairn, to Alexander Campbell of Barcaldine, advocate. Title Rent, other payments by tenants, tacks, etc. Offer by Barcaldine to James McDiamid at Acha, offering him farm of Acha for 11 years, containing acceptance. Title Letter from John McIlireach, Glendow, to Duncan Campbell, factor to Sir Duncan Campbell of Barcaldine, 1st bt. Description January 17. Offers for Achacha or Cuilcharran. March 3. John McIlirach and Patrick Sinclair. Making an offer for Achnareir and Acha. Title Letter from Malcolm Clark, mason, Oban, to Mr. Campbell, Baliveolan, and Duncan Campbell, factor to Barcaldine. Description Makes an offer for building bridges at Achacha and Aultgarrich. Dated at Oban. Opinion of Barcaldine in dispute between widow McDonald in Aucha and Dugald Cunningham in Fierlochan, anent a mare strangled by carelessness of said Dugald. Petition of widow McInver, Acha, to Duncan Campbell of Barcaldine, asking for her share in what was left by her spouse. Title Petition by John Thomson, tenant on the lands of Barcaldine, as executor testamentar, for licence to pursue for payment of the debts due to the deceased Duncan Thomson, his father, sometime tenant in Culcharron, thereafter crofter at Auchacha (Achacha). Granted. Title Letter from John MacDiarmid to Elizabeth Dennistoun, wife of Sir Duncan Campbell of Barcaldine, 1st bt. Description Hopes she will use her influence with writer's landlord, Barcaldine, to get writer a good croft to support his wife and family. Dated at Achacha. Title Petition by John Thomson, son of the defunct and Angus Thomson, his brother, crofter in Glasdrum, as executors testamentar, for licence to pursue for payment of the debts due to the deceased Duncan Thomson, sometime tenant in Culcharron, thereafter crofter at Auchacha (Achacha). Granted. Title Letter from Nicol Munro, writer, to Sir Duncan Campbell of Barcaldine, 1st b.t. Description Has been requested by Dugald Munro to apply to Barcaldine for payment doe to him for building a house on Barcaldine's farm of Achacha. Dated at Inveraray. Achacha is very visible on the 1871 OS map, with a number of significant buildings. Duncan Cunningham 56 chelsea pensionner Penisoner Late 42nd Regt Ardchattan CP & butler at Achinrier the census before! Achacha, 5 rooms with windows. Clearly from the documents and the Inverawe archives these were possibly even more significant in the 1600s. The forestry cottages that were built in the early 1900's are mostly gone, bar one that is can be found by following the road to Lochandubh kennels from the Salach glen road.